Home » Mars » What does this look like to you? Do you know what this is? Well at first it may not look incredibly interesting, but there is something fascinating happening here. 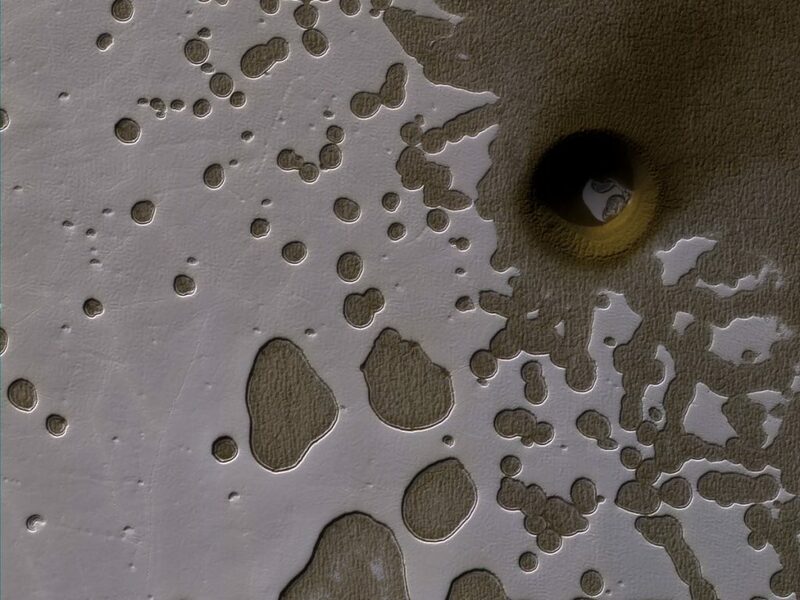 This is a “hole.” Not just any hole but a hole on Mars. What is really interesting is this is a hole found in the Southern hemisphere on Mars, and the Mars Reconnaissance Orbiter took the photo. What I love is scientists have no idea what created the hole. One theory is a meteorite impact. However, if so we know most meteorite impacts on Earth, Moon, and beyond have pointy rims like you would see on a coffee cup or the ice cream containers that you would buy from the grocery store. Instead, we see a smooth rim pointing downwards. Okay, so maybe it’s a pit that sunk in? If so, how did that happen? Mars should have a few more of these at least, right? Well, we don’t see a ton of these, in fact, this is the only one we see so far. Now, look at the next photo. It has carbon dioxide ice melted in “swiss cheese” patterns. This area becomes even more peculiar. It’s photos like these that not only keep us interested from an aesthetic point of view but when you hear that NASA scientists don’t even know how it got there that it makes you excited on exploring it. Today, the kids who are in middle school or high school will most likely be the ones exploring holes like this one on Mars. We have so much to understand and learn, and all it takes is being inquisitive and using your imagination. 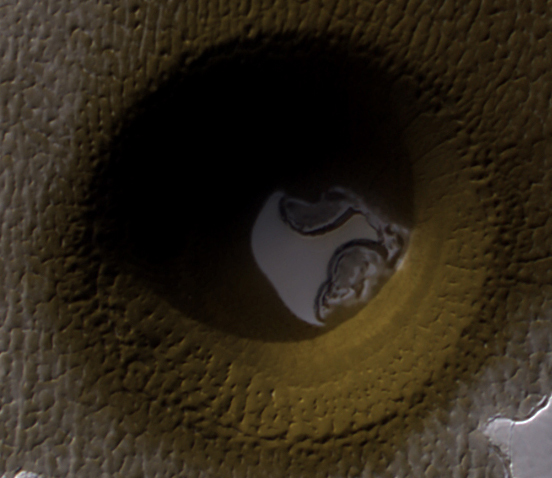 This hole on Mars could have a simple answer or something even more mysterious. The point is that humans are great at doing one thing and it’s exploring. I can’t wait until the day these “kids” explore Mars and provide more information on how this hole formed.